When you want others to view your Excel Online workbook but not make any changes to it, you can share it as a read-only workbook. In the To box, type email addresses of people you want to share with. Press ENTER between multiple addresses. Tip: If you’d rather get a link that you can manually paste into an email or web page, under Share, click Get a link. Under Choose an option, select View only, and then click Create link. 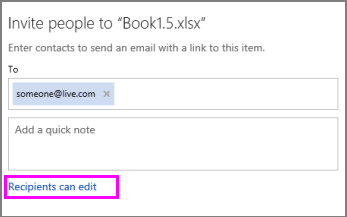 To set the workbook as view-only, click Recipients can edit. Click the arrow in Recipients can edit box, choose Recipients can only view, and then click Share. 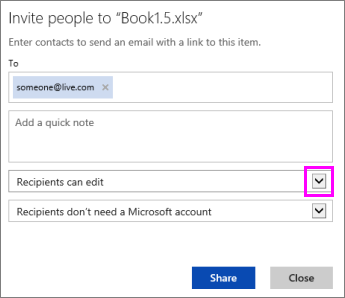 Excel Online emails a link to people you want to share the workbook with. Note: Sharing a workbook as read-only doesn’t prevent someone from downloading a copy of the workbook and making changes to their copy, but it does keep your original file intact. To learn more about sharing, see Sharing your workbook.